You can't fault the effort. It has to do something. The top of the league is actually strong (seriously) but Ohio State needs some marketing to get itself in the playoff. Part of the league's perception problem is because of years of non-conference losses and part is due to the unintended consequence of the Big Ten Network doing such a fine job broadcasting games that really shouldn't be broadcast. Such as last weekend when Penn State visited Indiana in the sporting equivalent of finding a body floating in Griffy Lake. So the conference is falling back on its default position and inventing something rather than just counting on the merits of this weekend's excellent Nebraska-Wisconsin game to stand on its own. And what better way to convey importance, significance and meaning than handing out a trophy after … well … damn near any game you win? In this case, meet the Freedom Trophy, presented to the Nebraska-Wisconsin victor each year … or until the league expands again and they rarely play. The Big Ten loves trophies. It now officially sponsors 14 of them for intra-conference "rivalry games" and league teams participate in non-conference games that dole out five more. This doesn't include bowl games, which award trophies but rarely to Big Ten teams (we kid). Some of these rivalry trophies are downright awesome. The winner of the Minnesota-Wisconsin game gets the "Paul Bunyan Axe" trophy. (This is not to be confused with the "Paul Bunyan Trophy" that Michigan and Michigan State play for and Michigan cares so little about that it traditionally stores the trophy in a closet.). The Bunyan Axe, however, is cool. It's huge, with a six-foot long handle and inevitably some victorious lineman grabs and pretends to chop down a goalpost. Note to Harvey Updyke, it's not used to chop down any actual trees. The Big Ten has perspective. The only downside to the Bunyan Axe is that it replaced the "Slab of Bacon" trophy which "disappeared" in 1948 because, well, if you had a chance to steal the Slab of Bacon trophy, wouldn't you? It was "discovered" in 1994 in a Wisconsin storage closet, prompting then-coach, now-AD Barry Alvarez to declare, "We took home the bacon ... and kept it." Why they didn't just create another Slab of Bacon trophy is one the Midwest's great mysteries. Others have a great backstory. In 1903, Michigan coach Fielding Yost was worried that Minnesota might try to poison the Wolverines during their game. So he ordered a manager to go buy a jug so they could control the water supply. Minnesota won and Michigan left the jug behind where a custodian named Oscar Munson found it. Some believe Oscar Munson stole it, but it has never been proven and we aren't here to impugn the reputation of a man named Oscar Munson. Let's just say anything is possible in an era of football when poisonings were a real coaching concern. And you thought the modern-day SEC is wild. 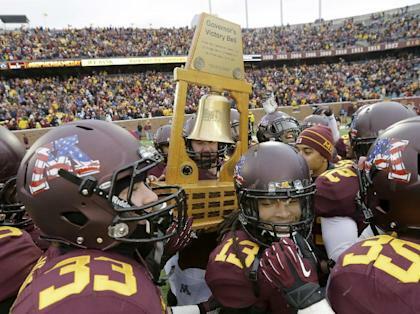 After the victory, Minnesota declined to ship the jug back and instead painted it brown and put the score on it. Then in 1909, for a rematch, it was determined that whoever won the game got the Little Brown Jug. And so it goes. Or there is the Floyd of Rosedale trophy, which is a giant pig. It commemorates a 1935 bet between the governors of Iowa and Minnesota before the Hawkeyes-Gophers game. The loser would deliver a prize hog to the other's office. Minnesota's governor used the occasion to trash talk Iowa farmers and declare that his state raised better pigs anyway. Great stuff that is being a little devalued by all the not-great stuff, the you're-trying-too-hard-stuff. Why should Wisconsin and Nebraska have a trophy? Is there an actual rivalry here? The teams have met just eight times since 1901 (4-4 record) and only three times since 1974. They don't border each other. They don't share a lot of animosity. If you walk around Sheboygan Falls, you won't hear a lot of mumbling about those no good folks from North Platte. They both have great programs and now that they are in the same division, perhaps it will get intense. Can't the league wait for something organic to just come up, a farm animal wager or a stolen cannon or a suspected poisoning or the mocking of Runza meat pies or a mean-spirited joke about the great G. Heileman that simply can't be tolerated? Isn't the inside track on the Big Ten West enough? In fact, the mere name suggests the Big Ten marketing department that brought you Leaders and Legends don't even believe in this. The Freedom Trophy? What is that? Was there ever any doubt in the freedom of Wisconsin or Nebraska? Has anyone tried to invade either place and establish totalitarian rule – we're looking at you Iowa. Big Ten marketing person No. 1: This is ham-fisted and meaningless. Fans are going to make fun of us. Big Ten marketing person No. 2: Call it the Freedom Trophy and say it honors veterans. The trophy will consist of two massive football stadiums merged together with an enormous American flag coming out of it. They can't make fun of that. You don't like freedom? You don't honor veterans? You don't like big stadiums and big flags? You Pac-12 commie. This is like a bad political commercial (this ad was brought to you by the third-and-long club of Fond du Lac). It's patriotic political correctness. The press release announcing the establishment of Freedom Trophy didn't mention doling out any actual money to veteran services. Want to honor veterans? Try passing the hat for the Wounded Warriors or something. Anyway, the Freedom Trophy is in. It isn't going anywhere. After all the "Governor's Victory Bell" (concocted in 1993) still goes to the winner of Penn State-Minnesota even though when the two teams finally meet again, in 2016, it will be just their fourth game in a decade. That's one lonely bell. All of these made-up rivalry games aren't exactly the equivalent of the participation trophy, because the loser doesn't get one. It's close though. It's a please-please-pay-attention-to-us, we're-actually-good ploy. Maybe they could just hand out the don't-you-know-Indiana-beat-Missouri-#SECBias Trophy. A gagged and bound Paul Finebaum could present it to the winner as everyone agrees Desmond and Herbie are ESPN brainwash victims for the way they hype up Alabama and never mention Indiana beat Missouri. On Twitter, a Nebraska fan named Paul Stanos suggested that if this has to happen, then why not scrap the old school trophy and instead hand out the "Upper Midwest Championship Belt" like the WWE. A championship belt? Now that would at least be interesting. They could emblazon a picture of Faux Bo Pelini's cat. Or a Slab of Bacon.